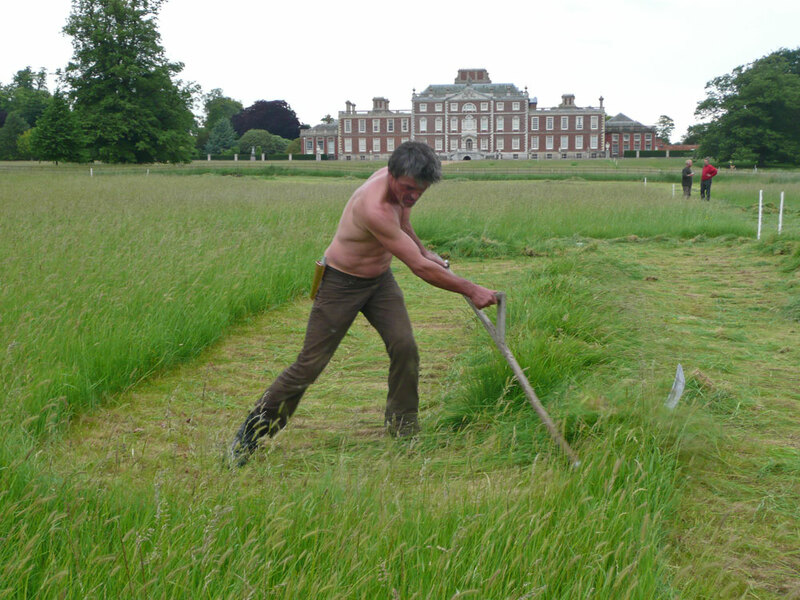 On average, the grass this summer at Wimpole was easier to mow than in 2011. The thinner areas were still very very difficult to cut well, particularly as cutting progressed and the effects of good peening began to wear off. Large plots are much closer to the reality of farm mowing so it was pleasing to see so many participants. Times for both 1/4 acre and 1/8 acre were about half of those of 2011 and the cutting quality was better. *Cheated as Simon F helped her! so new class 1/4 acre pairs. BSC scythe mower driven by Jim McVittae against the Austrian scythe used by Simon Damant no time record but Austrian scythe just squeaked in on time and the cut was much better by a country mile then the BSC scythe mower. 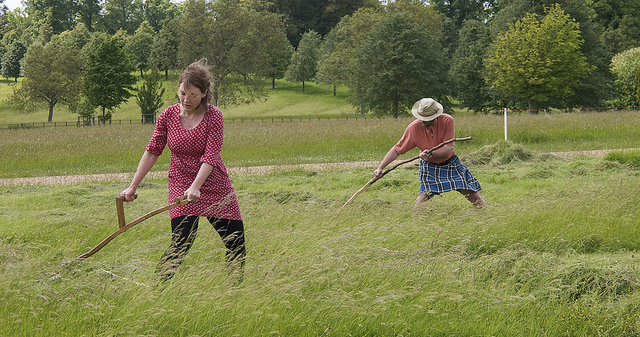 This entry was posted in Competition results, Scythe Festivals and Events. Bookmark the permalink. Hi, first of all I like your blog. I will like to read about the rules of the competition. I don’t see that in here. Can you tell me where to get them? I’m not sure the competition rules are officially written anywhere. 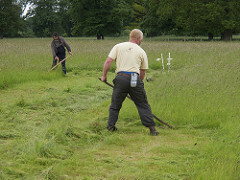 Each competitor has a randomly-chosen plot 5x5m to mow as fast and as well as possible. The plot is raked afterwards and the quality of the cut judged by a team of three judges wit each plot given a score from 1 to 10 (best). These judges along with the festival organiser then compare the results to decide the winners. There isn’t a strict formula for how this is done in Somerset but in Cambridge there is a 10s penalty for each quality point dropped. 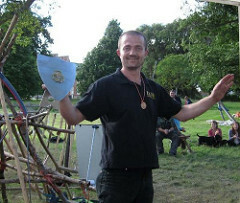 The winners of the Somerset event are regarded as the UK champions.